I suspect a majority of you just had an involuntary shudder at the thought of eating chicken livers sauteed whole and still just slightly pink inside. Not to worry, I was one with you until yesterday. 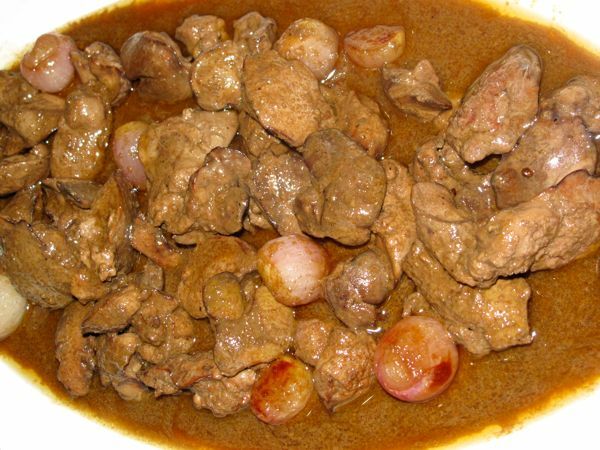 My mother used to cook chicken liver adobo every once in a while and it was nothing short of REVOLTING. The livers were hard and seriously overcooked, and felt like small pieces of chewy rubber. Being told they were rich in iron did not help one bit. When you actually put the liver your mouth and chewed, it was grainy, sandy and sucked up liquid — or so it seemed to me at the time. I have hated cooked whole chicken livers ever since. I have tried to get over food biases and childhood food quirks like this while maintaining this blog, so I decided to revisit sauteed chicken livers when the time was right. So here is the simple recipe of Kylie Kwong. I will warn you not to use a non-stick pan when cooking this. The sugar nearly did not caramelize properly and when I added the tablespoon of water, I had fireworks on the stovetop. It looked much less dramatic, or should I say painful, in her television show. Also, she did not, but I did, soak the cleaned and trimmed livers in milk for an hour before proceeding with the recipe. The milk bath removes impurities from the livers. Just drain well on paper towels before going on with the recipe. When cooking livers, DO NOT OVERCOOK or they will get tough. Slightly pink in the center is ideal. Anne, gosh, your memory is better than mine! You are right, I did that stir-fry from her other television series. Recipe here. It was good too… need to do it again soon. I tried that with your version…its really good..I just hope I can find a variety of corn with really big kernels so that it will be firm…or maybe I can substitute chickpeas? Yummy! I used to make chicken liver adobo fo myself and our daughter’s Rottweiler – until, she (the daughter) put a stop to it!! MM and other readers, if you happen to pass by any Nando’s Restaurant (Portuguese chain) you may wish to try their chicken liver appetizer, the taste of which seems to me almost similar to the recipe in this post. They also serve it with Portuguese roll (which to me also tastes similar to French baguette but softer). They don’t, however, put any vegetable garnishing on top. Finally, a recipe worth trying…..I’ve been avoiding chicken livers all my life. I love chicken liver and I do put it in every chicken/meat dish whenever possible such as adobo, tinola, sisig, side dish for chicken rice, and even beef steak style with calamansi and onion… Will try the above version since watercress and radishes are available here. everyone loves chicken livers in my family, so this is definitely a must-try. I dislike chicken livers too… let’s see if i can do this without chickening out. BTW, I also saw that episode of Kylie Kwong but maybe because of my aversion to liver, i wasn’t as inspired as you were. Sorry but I won’t change my mind about Chicken Livers.. nope.. =/ I still can’t eat it. i also watched that episode! i prefer the liver to be cooked all the way through, though. thanks for the tip about using milk to remove the impurities from the liver. appreciate it! The chicken livers look great and I want to cook some that way soon. I buy Pamora Farms whole chickens from Santi’s but, MarketMan, please tell me where I can buy organic chicken livers from the same source. I’ve always liked chicken liver as long as it wasn’t overcooked. If it was overcooked we just chopped it up and added it to pancit or chopsuey. Yummm! 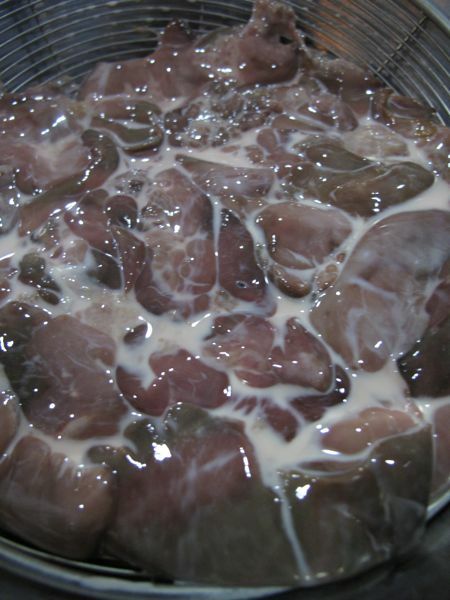 I do let my chicken liver soak in milk for a few hours before cooking and my liver gots to be fresh. I just sautee them in one of my cast iron pans and man is it soooo good. I try not to have it much as a man, I have no way of flushing out the excess iron in my system unlike women (they get to flush out some every month). Too much iron for us dudes, not good for the little swimmers hehehehe specially if you still want to propagate. LOVE chicken livers. As I’m prone to anaemia this is good. I do a version of this every Saturday night. Never soak the livers, just clean them well, specially any suspicious green bits (bile). I fry pieces of “poitrine fumÃ©” (smoked pork belly) but good smoked bacon will do. In the rendered fat, lots of chopped garlic, then the livers. A high heat caramelises the outside, pinkness is optional inside but as long as they don’t go hard you’re fine. I add grated lemon peel, some herbs (dried are fine – thyme, rosemary, basil…) and a bit of soy sauce and balsamic vinegar at the end to deglaze the pan. Served on a bed of aragula – heaven! Reading this post at 1AM is sooo bad, as I absolutely love chicken livers! Must try this. Thanks, MM! Josephine, that dish sounds fantastic! Winky, were the dogs allowed to dine at the table with the “masters”? Tony Lee, the livers are available every Saturday and Sunday at the Mercato Centrale in Fort Bonifacio, from the Pamora stall. pamora farms also sells liver pate at the mercato centrale during the weekends. but this one looks so much more interesting. will give it a try. i generally avoid pink liver, the thought makes me queasy. Wild arugula! Oh my! I love wild arugula and have been on the look out since Gil Carandang stopped growing it…thanks for the heads up! 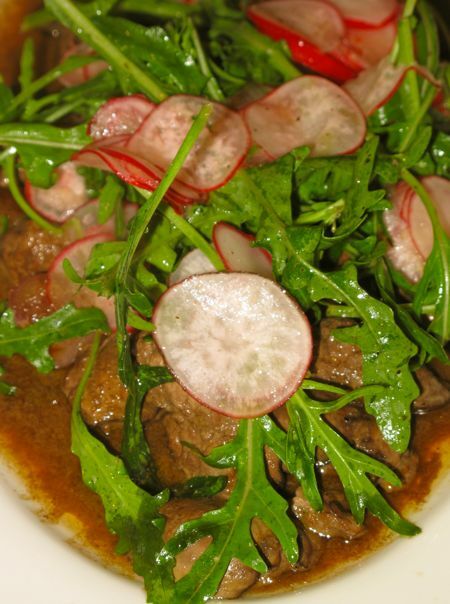 Now, as for livers, I am still dragging my feet over that…although this dish does look and sound good! MM, i did a similar version to this dish sans the milk soak and brandy. It was still yummy, though. josephine, i wanna try your dish… I’m curious about the balsamic vinegar on liver. I love both but never imagined using them together in one dish. @ phil…you are right, nando’s resturant do have this liver appetizer. it is sooooo good. parang adobong atay ang lasa. my family and i never fail to order this every time we are in nando’s. they also have good chicken dish. love it!!! I love chicken livers!!! I dont understand why other peope cant take it… I also love Kylie Kwong. Thanks Marketman, you are my go-to guy for delicious and easy-to-make recipes (you make cooking very effortless)! Mabuhay ka! I love chicken liver! Will definitely try this over the weekend. oh i miss nando’s in london where i fondly call it their local version of Max’s because of the logo. Finely chopped chicken livers make great gravy for breaded chicken marinated in milk, salt and pepper. With some cold salad and drinks, and some hot baked potatoes with sour cream, heaven! Hi MM what would be good alternative to brandy and sherry vinegar. Thanks!! Hi MM, I used to hate liver, actually I still am not a big fan. But there is one liver dish that has destroyed by biases and this is the chicken liver dish at Nandos. The liver is so tender and soft and just perfect for putting on top of warm bread as an appetizer. Have you had the chance to try this dish at Nandos? Putahe Idol – The Results!!! Shippingcart.com service to the Philippines — THINK THRICE BEFORE YOU DO IT.